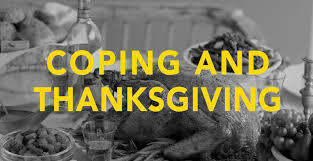 Like millions of other people, the beginning of the holiday season, starting with Thanksgiving, is a difficult time of year. And as the weeks continue, the season can be even more overwhelming. I was diagnosed with Hodgkin’s Lymphoma over 27 years ago. Thanksgiving was a week later, and the last thing I felt like being, was thankful for anything. Years later, during marriage #1, my father-out-law, also the weekend before Thanksgiving, is misdiagnosed with having Alzheimers, leading to a 3-year medical imprisonment until the accurate diagnosis is made, and he actually recovered. And two years ago, someone very close to me, unknowingly spent the last Thanksgiving with her son. Having just recovered from a complication from cancer treatment, things suddenly changed, and instead the last memory she now has of her son, was the decoration of a tree that she otherwise would not have purchased that early. And besides those who faced trials and tragedies at the holiday onset, there are so many who are facing the holidays for the first time without their loved ones. And I find myself once again, heading towards another “anniversary” that is a reminder of a period in my life that I would rather not be facing. Each and everyone of us mentioned above, would give anything to have the precious moments back that we no longer get to experience other than the memories. But that does not mean, that this post should be perceived as sad, or negative. In fact, quite the contrary, and I honestly believe that everyone that I am thinking about as I write this, deep down is quite thankful. We are thankful for the support of everyone who helps us through our difficult times. We are thankful for everyone who encourages us. We are thankful for those in our lives who have the patience to allow us to reflect on our losses, offer a shoulder, and then hold our hands to lead us forward.